Handbag? Your favorite everyday item! Made from 100% recycled sail, it is the must have fashion item, and shouldn’t be neglected. If you are looking for a unique handbag, you are in the right place. The Legend, Sam or Sandy, opt for your recycled sail handbag. And if you do not find the right one for you, you can always customize your own bag. 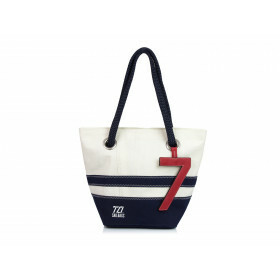 The 727 Sailbags handbag; your new essential accessory.